Pontlottyn Bed and Breakfasts. Compare latest rates and Live availability for all your favourite places and places you have always wanted to go using our new My Shortlist feature. Click + to add to your Shortlist. Bed and Breakfasts in Pontlottyn, Gwent for 1 night from Sun Apr 21, 2019 to Mon Apr 22, 2019 within 10 miles, in an Average Nightly price range of £1 to £200. Ebbw Vale Guest House is located in Ebbw Vale. The accommodation provides free WiFi. Newport is 37 km from the guest house, while Brecon is 30 km from the property. The nearest airport is Cardiff Airport, 69 km from the property. Located in a peaceful South Wales village close to Brecon Beacons National Park, Soar Chapel provides guest house accommodation. Free private parking is possible on site and free Wi-Fi is accessible throughout. Formerly a Baptist church, Soar Chapel has been completely refurbished, to give it the unique and luxurious appearance it now has. There is a selection of rooms, some with a private bathroom whilst others share. All rooms have a TV and DVD player, tea and coffee making facilities, and complimentary toiletries. Included in the room rate is a hearty breakfast, where locally sourced Welsh produce is used wherever possible. Several options for lunch and evening meals, pubs and shops can be round within 2 miles of the property. The area around Soar Chapel contrasts between steep wooded valleys and open remote moorland and the guest house is close to numerous local walking and cycling paths. The Big Pit: National Coal Museum is a 15-minute drive away. A warm welcome awaits you at this former Baptist Chapel which now serves as a luxury guest house in Ebbw Vale South Wales. Soar Chapel began life in 1851 as a fellowship of Protestant Dissenters from the Church of England of the Denomination of the Baptist. It was welsh speaking until 1904-05 when 100 were baptised and membership reached 254 then services began to be entirely in English. It closed its doors for what was thought the last time about twenty-six years ago. We purchased the Chapel in 2000 and set about lovingly restoring it to make it our family home. We are now open as a Guest House and are extending our hospitality to visitors from all corners of the globe.We are known for the special care and attention to detail which we provide for all of our guests. We want to make your stay with us as relaxing and enjoyable as possible. There is something for everyone at Soar Chapel. With a garden and a bar, The cross oak inn is located in Blackwood and features free WiFi. Guests at the bed and breakfast can enjoy a Full English/Irish breakfast. Cardiff is 27 km from The cross oak inn. The nearest airport is Cardiff Airport, 46 km from the property. Situated in the World Heritage site of Blaenavon, The Lion Hotel & Restaurant offers a health suite with sauna, steam room and heated loungers. There is also a restaurant and lounge with real log fires, and free WiFi available. The rooms have over-sized beds, thick carpets and en-suite bathrooms or showers. Each room has a TV, tea/coffee making facilities, toiletries and soft fluffy bathrobes with a choice of quilts for each season. The Lion Hotel's Restaurant offers an Ã la carte menu of European dishes, made using fresh local produce. The property's bar also offers guests a bar menu as well as coffee and afternoon tea, complete with log burner. The Lion offers a range of facilities including a health suite which has separate changing and shower facilities, where a private massage can be pre-booked directly. There is also an outdoor patio area, which leads to the car park and is free of charge to residents. Set amidst 100 acres of meadowland and spectacular valleys of Southeast Wales the four-star Bryn Meadows Golf Hotel & Spa makes for a perfect retreat for travellers looking for a tranquil space to conduct business or to simply relax and rejuvenate. Our beautiful resort boasts of extensive leisure and spa facility as well as our own challenging 18-hole golf course nine-hole First Swing Academy course and indoor putting studio. Ideally located in Caerphilly county we are only a 30-minute drive from the vibrant capital city that is Cardiff and its numerous entertainment opportunities. At Bryn Meadows Hotel choose among our 42 en suite rooms all are well-appointed and furnished with amenities like free Wi-Fi LCD TV and safe deposit box. Our rooms feature Italian furniture soft furnishings marble bath and sink tops. Many of our rooms have balcony or patio where you can breathe in the fresh air and take in amazing views of the surrounding golf course some with views as far as the Brecon Beacons. The Clubhouse Bar and Blas at Bryn Meadows restaurant offer the perfect dining experience with stunning views and constantly changing menus using the finest local Welsh ingredients. For pampering sessions step into our Fusion Spa & Wellness where you can take a dip in the 18-metre indoor pool or relax in the revitalising heated waters of the hydrospa and Jacuzzi. You can also enjoy the thermal benefits of the aromatherapy suite and the sauna and steam room or sign up for stress-relieving massages at our relaxation and treatment rooms. We also have an equipped gymnasium where you can work up a sweat. You can also host your corporate or social functions for up to 120 delegates at our conference/event facilities. If you want to immerse in local history and culture you can head out two miles to the town of Caerphilly and attend fairs go cycling and walking or visit the Caerphilly Castle. Bryn Meadows Golf Hotel & Spa is a 15-minute drive from the train station and a 45-minute drive from Cardiff Airport. For added convenience we offer free parking on site and free Wi-Fi throughout the hotel. The Old Six Bells is a Grade II listed house offering accommodation within an exclusive and family atmosphere. The house dates back to 17th century. The family has taken care to refurbish the property resulting in an exquisite place to stay. Featuring a bar and a restaurant, Cambrian Inn is located in Tredegar. Dating back to 1809, the property offers free onsite parking and rooms with free Wi-Fi. The rooms include a Freeview TV and tea and coffee making facilities. Each room benefits from a private bathroom with a power shower and complimentary toiletries. In the mornings, the Cambrian Inn serves traditional cooked breakfast and continental options are also available. Guests can enjoy lunch and evening meals in 'The Cam' restaurant, including a popular Sunday roast. Often host to live musical entertainment, the bar has a range of real ales and wine from around the world. Festival Park Shopping Village is just 15 minutes' drive from the Cambrian Inn and the Big Pit National Coal Museum is within 9 miles. Originally a 16th century farmhouse, this friendly country inn is set in its own grounds, overlooking the small town of Blackwood, near Newport, with the Brecon Beacons within easy reach. Pengam Train Station is 2.7 miles away and there is a bus interchange just 0.5 miles away. There are 15 modern en-suite rooms, each with satellite TV. WiFi access is available throughout. 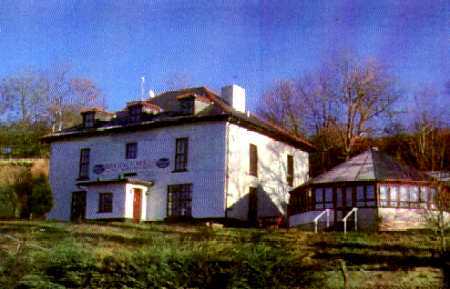 Brewers Lodge was once owned by the family of the infamous Captain Henry Morgan. Just a short distance from some of the region's most beautiful woodland, the lodge is nevertheless within easy reach of the cities of Newport, Cardiff and Bristol.